I love this recipe, it is my go-to for days when I want to watch my carbs but not starve ( You know what I mean right ;-)). It is more an Indian recipe with a touch of Goan spices and fresh grated coconut. 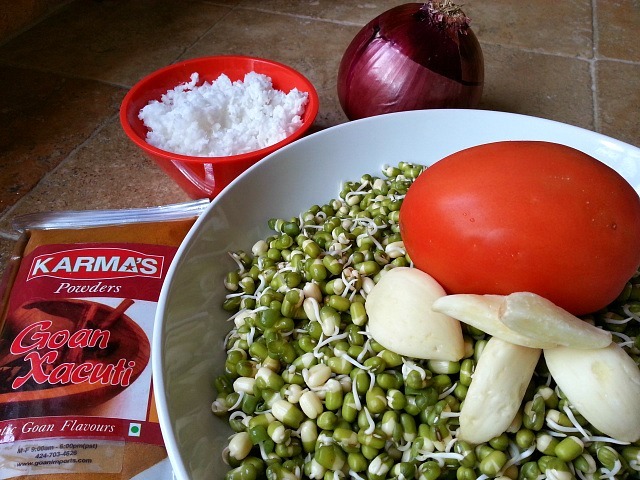 It does take planning to make this recipe as you need to soak the moong beans at-least overnight or for 2 days. If you have a pressure cooker then you can skip soaking. At times I like to sprout extra moong dal (mung beans) so I can make a Goan Tea time sweet called “Chunn” which was made years back. Traditionally it is made with chana dal but I use moong beans since I usually have it in my pantry. It is made by steaming the moong beans and then mixing it with fresh grated coconut, cardamom and Goan coconut jaggery( I get mine imported from Goa). Soak the mung beans in water overnight. Then pour out the water and let it sprout one more day. Cover the top of the moong dal with wet paper towel. 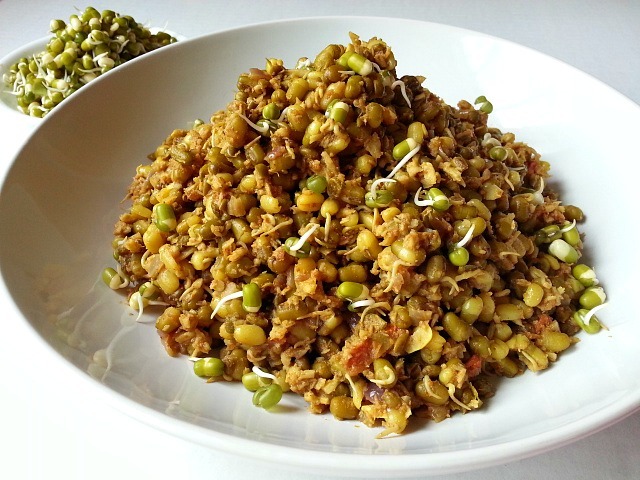 A 1.25 cup of dry moong dal will yield approx 3.5 to 4 cups of sprouted mung beans. Fry the onions till translucent. Next add the tomatoes, garlic and saute for 2-3 minutes till the tomatoes soften. Then add the xacuti masala spice mix and saute for another 2 minutes. Add water, season with salt, cover and bring to a simmer. Next add the sprouted moong dal, mix well and cook covered on low medium heat for 15-20 minutes. Check on salt. Garnish with fresh chopped cilantro/coriander. I also like to garnish it with fresh made salsa. Serve with hot white rice, bread or naan. 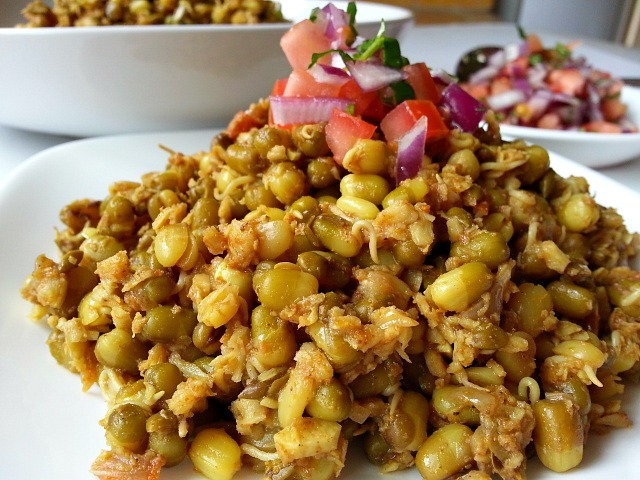 If you love moong dal (mung beans) like me then check out more recipes made with moong. Gorchem – Moong Dal Pudding made with fresh grated coconut and jaggery. Having seen your recipe I’ll have to go investigate what I have left. Looks good! FYI, I briefly mentioned you in today’s blog post. Keep coming with those recipes! Your pictures are always so great! This looks delicious! I am soon going veggie, definately trying this out first! Thank You :-). That makes me happy to know you will give it a try. I can’t wait to try out this recipe! Thank you for sharing it. Thank You Diane :-). Please do let me know how it goes. Lovely! Go-for-days recipe are often delicious and very useful when you don’t have time to cook during the week. 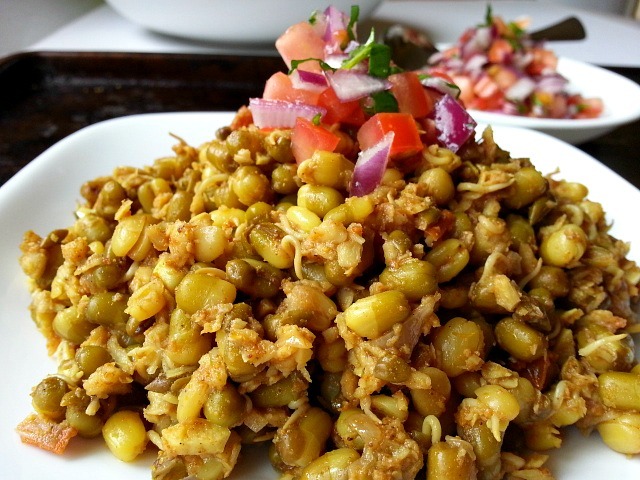 This is a wonderful vegetarian dish! Wow very interesting. Never knew about the masala and I love coconut.. Wish I could get that masala and give it try. Learnt something new today. Thank You Vidhya. I am happy you found it informative. You can find the masala on this website http://www.goanimports.com. That’s a delicious recipe!!! I simply use red chili powder 🙂 Looks fabulous!!! This looks delicious! Nice recipe, thanks for sharing! Sprouted moog dal looks breathtaking. I remember My sister in Goa would leave the moog in a bowl for a day or two, and then eat them when they put out shoots. She thought that was a healthy, way of consuming moog. She tried to feed Me some. But they were not really My cup of tea. Of course Your moog dal dish looks incredible. I think it makes better sense to eat moog dal Your way. For no recipe that comes from You can ever flop. What I am going to do is email Your amazeballs sprouted moog dal recipe to Her. Hope She takes it on board. Will give this incredible dish a go in the near future. And I will give You My kind feedback. Thank You Mr Stan for your kind words. I will have to agree with your sister on that Mr Stan. Just add some diced onions, tomatoes, green chili, fresh chopped corriander, lemon juice and salt. Let it stand for 30 minutes and I am sure you will enjoy it :-). I will be looking forward to hearing you verdict on the recipe :-). You and Mrs Stan take care and have a great weekend. 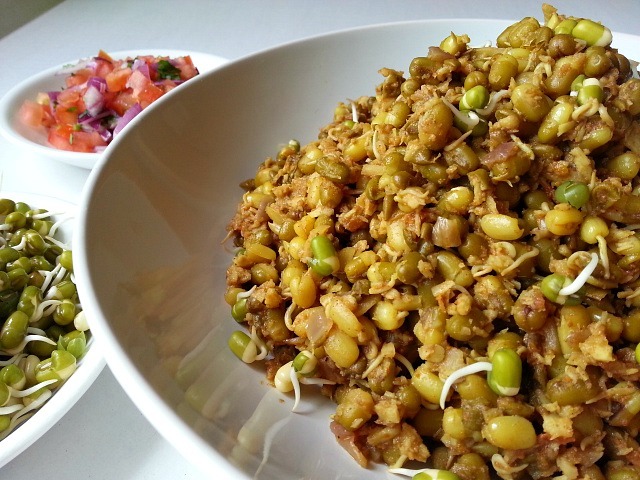 I love sprouted mung beans. Your version looks dee-licious. Thanks for the recipe. such delicious and great recipe – You bring always with great presentation!